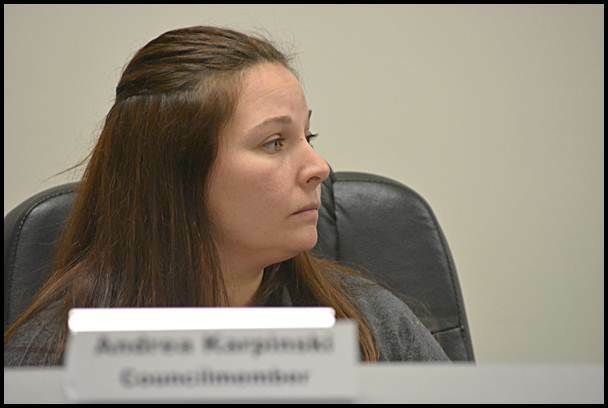 Newly-elected Councilmember Andrea Karpinski was appointed as Mayor Pro Tem after an arduous process that seemed to divide the council. That seems to be the question in the air after the very first meeting of the city council this past Tuesday when it met to select who will fill the role of Mayor Pro Tem. The councilmember who is appointed to that position chairs council meetings when the mayor is absent and stands in for the mayor at special events when asked to. Despite the handshaking and congratulations at Sunday’s inauguration of newly elected officials, those glad tidings seemed to come to a screeching halt during the nomination process. The first five nominees failed with win a majority approval of the council, with the council falling along apparent ethnic political lines. The three Bengali councilmembers voted only for the Bengali members nominated for the position, and the non-Bengali councilmembers voted only for themselves. Mayor Karen Majewski refused to break the first four ties, but conceded that in the past she had previously told councilmembers they can’t refuse to vote unless there is a direct conflict of interest. The first four to be nominated were Titus Walters, Anam Miah, Mohammed Hassan and then Robert Zwolak. The only two councilmembers not nominated were newcomers Andrea Karpinski and Abu Musa. After about 30 minutes of this back and forth, the council took a five-minute break to collect their thoughts and reconsider the nominations. Back in session, Councilmember Musa nominated Hassan again, despite Mayor Majewski’s reminder that only those who voted against a nominee can propose reconsideration of that person. Mayor Majewski asked the council if any of them who had voted against a councilmember was willing to re-nominate one of them. There was no response. Councilmember Robert Zwolak then nominated Karpinski, which again resulted in the same three-three deadlock, with Councilmembers Walters, Zwolak and Karpinski in support and Councilmembers Musa, Miah and Hassan voting on the other side. But this time, Mayor Majewski said “my hand is forced” and broke the tie by voting for Karpinski. It was unclear why Majewski came to that conclusion. She did not return a call for comment at the time The Review went to press. If Majewski had not broken the tie, there was still one more councilmember who had not been nominated to consider, Abu Musa. Reached by phone, Councilmember Miah said he was not surprised there was a series of tie votes. “I expected that, and the mayor breaking the tie,” he said. Although he said it was a bad start for the council, he insisted he didn’t vote along ethnic lines on purpose. “I don’t think a Bengali should have gotten it just because they’re a Bengali,” Miah said.